ok, so maybe not the worst, but i’ve left the internet (I’m not arrogant enough to think i have readers) hanging for ten months!!!! In all fairness I was overseas for about half of that, and i am only just starting to put my life back together! Apparently that includes blogging! Secondly, I made some amazing improvements in my spinning ability over the summer. I was in Adelaide working on a theatre show, so i pretty much just rehearsed, organised and spun (and knitted a bit…). I moved on to some BEAUTIFUL fibres and worked with plying different fibres together and all sorts of things. My wheel is still in Adelaide and I am in Melbourne, so i have to take yet another break, but luckily it is much like riding a bike. I do have a nice new spindle, so I really should try that out. Thirdly, I have written up my first pattern. Yep. My very first written out pattern that I created. 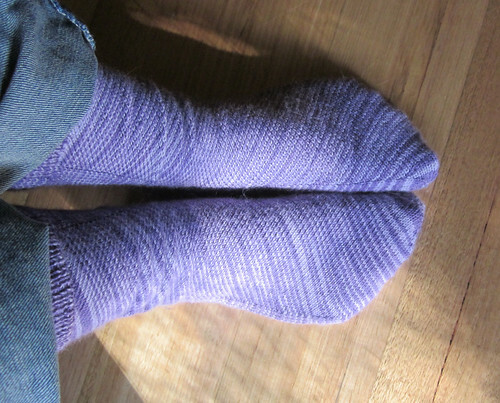 It’s socks, so I kinda borrowed heel flap concepts from another pair I’d just knitted, but other than that it’s all me. 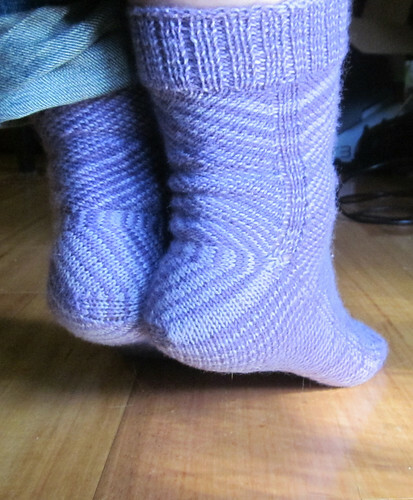 I worked out how many stitches, and a cute little cable into the heel flap and all sorts! I have two lovely ravellers knitting it at the moment and hope to have it available as a free download on this site and on ravelry (or at least as a post here) in a few weeks!!! EXCITING! Christmas is also coming up, but i don’t quite know what I will be doing knitting wise, since my aunt has decided to do a stupid secret santa thing. So not sure who my chosen recipient is, but will make something for them. As for besties and my mum, dad and grandparents, I’m not sure. Definitely not as organised as last year. But on the plus side, I only work one day a week (boo, more days in the yarn store please!) and can knit like the WIND! and of course there’s always crochet. So. Exciting posts ahead. I will pace myself though, otherwise I’ll be burnt out by xmas and you’ll have to wait another ten months!